Interior designers come with all manner of ideas: the good, the bad, and the quirky. I think caveat emptor, “let the buyer beware” may apply in some cases. I was in a high-end interior design showroom where I saw portraits hung upside down and sideways. I asked my rep “What’s with this?” My rep explained that one of their guest designers intended to add “quirkiness” to the collection as well as to draw attention to it. He wanted to make the installation less serious — using more formal and staid elements in an unexpected way. I’m all for doing something unexpected to enhance the design, but not to take away from it. 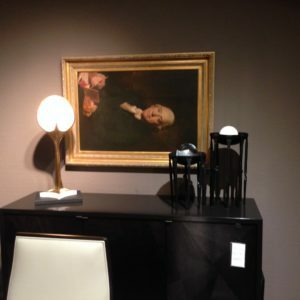 In my opinion, the focus of the space in the showroom ended up being on something that feels wrong, the sideways hung portrait, thus drawing attention away from the beautiful room. The fact that traditional portraits from another century were used in a contemporary space is enough of a surprise without hanging them upside down. If an interior designer is recommending that you do something that is definitely not “you”, then don’t do it. Let the designer do the quirky idea in their own home if they think it is so great.